Because your safety is our number one priority. 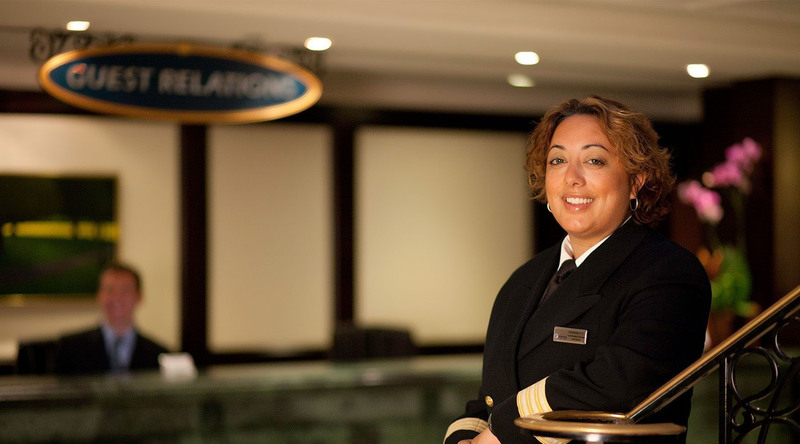 For Azamara Club Cruises and parent company, Royal Caribbean Cruises Ltd, the safety of our guests and crew has always been our highest priority. Our marine safety record over our corporation's operating history - illustrates our commitment to the safety of our guests and crew who sail with us each year. The measures we take in the interest of safety are many, with our ships often exceeding what is required by regulatory authorities. It's all part of our commitment to innovation and continuous improvement in every aspect of our business. At the beginning of every cruise, shipboard crew members guide every one of our guests through a mandatory drill known as the "Muster Drill", to ensure they are familiar with what to do and where to go in the unlikely event of an emergency. To further ensure they are aware of their specific muster location, we identify it on each guest's card key. The location also is prominently noted on the back of every stateroom door. In addition, our vessels – regardless of where they're sailing in the world – comply with the U.S. Cruise Vessel Security and Safety Act (CVSSA) requirements, including railing heights, access control, closed circuit TV, medical preparedness, crime allegation reporting and crew training. Our own requirements generally exceed those specified within the CVSSA. We work closely with regulatory authorities to improve safety laws, and regularly participate in discussions and studies to inform legislators of current practices and offer our perspective on regulations and standards to assure safety. Flag State authorities and other maritime safety regulatory bodies, such as the U.S. Coast Guard, from each country our ships visit also regularly inspect our ships. Their examinations focus on life-saving equipment and safety and environmental protection items. In addition to these inspections, our own ongoing system of internal as well as external (independent) marine expert audits also help us to remain vigilant, safely operate our ships and maintain effective systems.